On all covers within 200 miles of the greater Houston area. Call to chat with our cover experts from 9am – 5pm CST. Quality products made from the best materials. The Boat Garage by SlipSki Solutions is designed and manufactured, in Houston, TX. 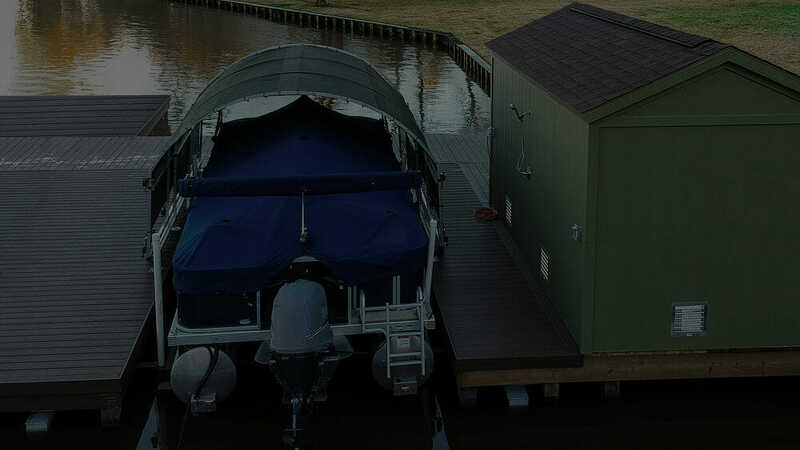 SlipSki offers an alternative to inferior boat dock covers, as well as expensive boat houses. In addition to our line of boat dock covers, we now offer “The Car Garage” to protect that beautiful ride of yours. If you have personal property or an outdoor space you’d like to protect from inclement weather, including hail damage, we have the solution! The SlipSki Boat Dock Cover is a new and innovative way to cover protect your investment. We have engineered a modular boat slip cover, made of marine grade aluminum designed to cover all sides of your boat. The SlipSki Boat Dock Cover comes with a three-year manufacturer warranty and is patent pending. This means we are willing to go through the extensive patent process to ensure consistent, quality and exceptional design, “no copycats.” You will always have our support when it comes to our boat slip covers and vehicle covers. Ask Us About Our First To The Area Discount! SlipSki Solutions we are is committed to customer satisfaction and the staple of our success lies in the care of our customers. We achieve this by conducting our customer service with a “Never Say No” attitude and being versatile to meet your needs. We will do everything possible to provide you with a product that will serve your personal needs. If you can’t find what you are looking for, let us know and we will work together with you to create what you need. We create modular designs that will evolve with your needs. We only use the highest quality materials specifically chosen to last in a harsh environment, ensuring our products will last. We strive to improve a wide variety of current “solutions” and innovate new solutions superior to that of our competitors. Products designed by SlipSki Solutions are not aimed at being the cheapest nor the most expensive products available but instead aim at being the best quality and best solution at a price point affordable to you. We don’t cut costs in our materials or engineering, rather we find new ways to manufacture and design our products. This mindset ensures our products are built to last and designed to serve your needs seamlessly and reliably. Why SlipSki Boat Lift Covers? We’ve got answers. . .
What materials does SlipSki use? The SlipSki Boat Dock Cover is a new and innovative way to cover protect your investment. We have engineered a modular boat slip cover, made of marine grade aluminum designed to cover all sides of your boat, automotive or RV and allow easy access.. . . Does SlipSki offer a warranty? The SlipSki Boat Dock Cover comes with a three-year manufacturer warranty and is patent pending. This means we are willing to go through an extensive process, spending time and money, to ensure the people we are the ones taking care of our customers.. . .
SlipSki Solutions Products are designed and manufactured, in Houston, TX. SlipSki Solutions offers an alternative to inferior boat dock covers, as well as expensive boat houses. In addition to our line of boat dock covers, we now offer “The Car Garage” to protect that beautiful ride of yours.